The Storm Prediction Center has come out with new tornado numbers for 2013 and they indicate that the number of tornadoes are below normal this year. Through August 20, 2013 the SPC has recoreded 610 tornadoes. That is only 62% of the twelve year annual average, 984. We should see a ramp up of severe weather in the next three months but enough to make up the 374 deficit? Not likely. Although the numbers are low for this year, this isn't the lowest we've seen through August. According to SPC, in 2002 there were only 579 tornadoes through late August. 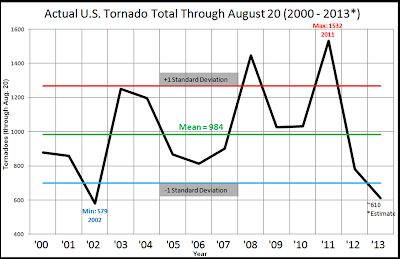 Notice in the graph above there were increased periods of tornadoes in 2003 and 2004 and again 2008 through 2011. This is an interesting trend as 2012 was also well below normal. 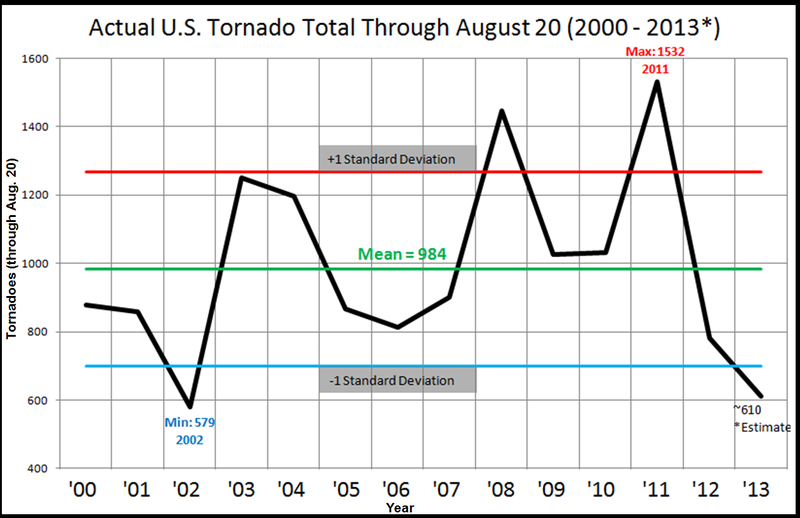 Severe weather statistics do go through cycles. If we can get a few tropical systems coming on land, these numbers could quickly jump.